Before them are dozens of massive stone pillars arranged into a set of rings, one mashed up against the next. Known as Göbekli Tepe (pronounced Guh-behk-LEE TEH-peh), the site is vaguely reminiscent of Stonehenge, except that Göbekli Tepe was built much earlier and is made not from roughly hewn blocks but from cleanly carved limestone pillars splashed with bas-reliefs of animals—a cavalcade of gazelles, snakes, foxes, scorpions, and ferocious wild boars. The assemblage was built some 11,600 years ago, seven millennia before the Great Pyramid of Giza. It contains the oldest known temple. Indeed, Göbekli Tepe is the oldest known example of monumental architecture—the first structure human beings put together that was bigger and more complicated than a hut. When these pillars were erected, so far as we know, nothing of comparable scale existed in the world. At the time of Göbekli Tepe’s construction much of the human race lived in small nomadic bands that survived by foraging for plants and hunting wild animals. Construction of the site would have required more people coming together in one place than had likely occurred before. Amazingly, the temple’s builders were able to cut, shape, and transport 16-ton stones hundreds of feet despite having no wheels or beasts of burden. The pilgrims who came to Göbekli Tepe lived in a world without writing, metal, or pottery; to those approaching the temple from below, its pillars must have loomed overhead like rigid giants, the animals on the stones shivering in the firelight—emissaries from a spiritual world that the human mind may have only begun to envision. Archaeologists are still excavating Göbekli Tepe and debating its meaning. What they do know is that the site is the most significant in a volley of unexpected findings that have overturned earlier ideas about our species’ deep past. Just 20 years ago most researchers believed they knew the time, place, and rough sequence of the Neolithic Revolution—the critical transition that resulted in the birth of agriculture, takingHomo sapiens from scattered groups of hunter-gatherers to farming villages and from there to technologically sophisticated societies with great temples and towers and kings and priests who directed the labor of their subjects and recorded their feats in written form. But in recent years multiple new discoveries, Göbekli Tepe preeminent among them, have begun forcing archaeologists to reconsider. At first the Neolithic Revolution was viewed as a single event—a sudden flash of genius—that occurred in a single location, Mesopotamia, between the Tigris and Euphrates Rivers in what is now southern Iraq, then spread to India, Europe, and beyond. Most archaeologists believed this sudden blossoming of civilization was driven largely by environmental changes: a gradual warming as the Ice Age ended that allowed some people to begin cultivating plants and herding animals in abundance. The new research suggests that the “revolution” was actually carried out by many hands across a huge area and over thousands of years. And it may have been driven not by the environment but by something else entirely. After a moment of stunned quiet, tourists at the site busily snap pictures with cameras and cell phones. Eleven millennia ago nobody had digital imaging equipment, of course. Yet things have changed less than one might think. Most of the world’s great religious centers, past and present, have been destinations for pilgrimages—think of the Vatican, Mecca, Jerusalem, Bodh Gaya (where Buddha was enlightened), or Cahokia (the enormous Native American complex near St. Louis). They are monuments for spiritual travelers, who often came great distances, to gawk at and be stirred by. 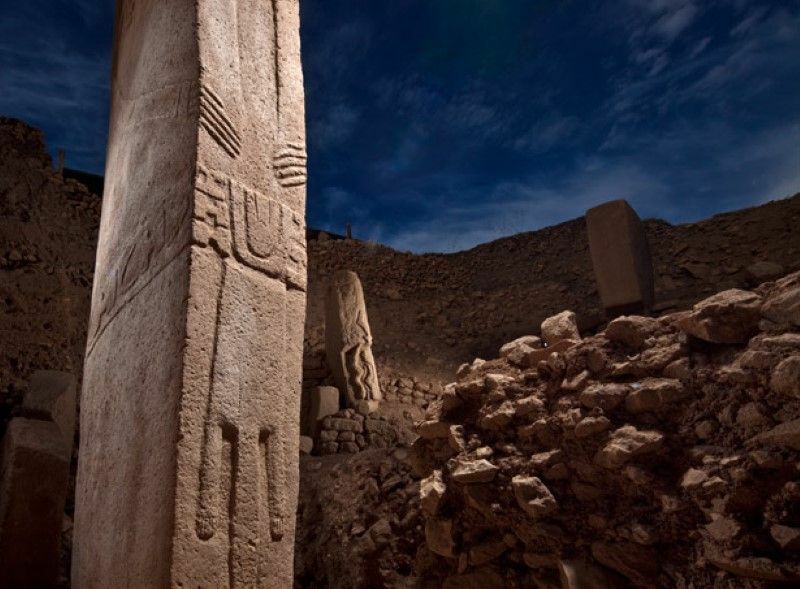 Göbekli Tepe may be the first of all of them, the beginning of a pattern. What it suggests, at least to the archaeologists working there, is that the human sense of the sacred—and the human love of a good spectacle—may have given rise to civilization itself. Klaus Schmidt knew almost instantly that he was going to be spending a lot of time at Göbekli Tepe. Now a researcher at the German Archaeological Institute (DAI), Schmidt had spent the autumn of 1994 trundling across southeastern Turkey. He had been working at a site there for a few years and was looking for another place to excavate. The biggest city in the area is Şanlıurfa (pronounced shan-LYOOR-fa). By the standards of a brash newcomer like London, Şanlıurfa is incredibly old—the place where the Prophet Abraham supposedly was born. Schmidt was in the city to find a place that would help him understand the Neolithic, a place that would make Şanlıurfa look young. North of Şanlıurfa the ground ripples into the first foothills of the mountains that run across southern Turkey, source of the famous Tigris and Euphrates Rivers. Nine miles outside of town is a long ridge with a rounded crest that locals call Potbelly Hill—Göbekli Tepe. In the 1960s archaeologists from the University of Chicago had surveyed the region and concluded that Göbekli Tepe was of little interest. Disturbance was evident at the top of the hill, but they attributed it to the activities of a Byzantine-era military outpost. Here and there were broken pieces of limestone they thought were gravestones. Schmidt had come across the Chicago researchers’ brief description of the hilltop and decided to check it out. On the ground he saw flint chips—huge numbers of them. “Within minutes of getting there,” Schmidt says, he realized that he was looking at a place where scores or even hundreds of people had worked in millennia past. The limestone slabs were not Byzantine graves but something much older. In collaboration with the DAI and the Şanlıurfa Museum, he set to work the next year. Inches below the surface the team struck an elaborately fashioned stone. Then another, and another—a ring of standing pillars. As the months and years went by, Schmidt’s team, a shifting crew of German and Turkish graduate students and 50 or more local villagers, found a second circle of stones, then a third, and then more. Geomagnetic surveys in 2003 revealed at least 20 rings piled together, higgledy-piggledy, under the earth. The circles follow a common design. All are made from limestone pillars shaped like giant spikes or capital T’s. Bladelike, the pillars are easily five times as wide as they are deep. They stand an arm span or more apart, interconnected by low stone walls. In the middle of each ring are two taller pillars, their thin ends mounted in shallow grooves cut into the floor. I asked German architect and civil engineer Eduard Knoll, who works with Schmidt to preserve the site, how well designed the mounting system was for the central pillars. “Not,” he said, shaking his head. “They hadn’t yet mastered engineering.” Knoll speculated that the pillars may have been propped up, perhaps by wooden posts. To Schmidt, the T-shaped pillars are stylized human beings, an idea bolstered by the carved arms that angle from the “shoulders” of some pillars, hands reaching toward their loincloth-draped bellies. The stones face the center of the circle—as at “a meeting or dance,” Schmidt says—a representation, perhaps, of a religious ritual. As for the prancing, leaping animals on the figures, he noted that they are mostly deadly creatures: stinging scorpions, charging boars, ferocious lions. The figures represented by the pillars may be guarded by them, or appeasing them, or incorporating them as totems. Puzzle piled upon puzzle as the excavation continued. For reasons yet unknown, the rings at Göbekli Tepe seem to have regularly lost their power, or at least their charm. Every few decades people buried the pillars and put up new stones—a second, smaller ring, inside the first. Sometimes, later, they installed a third. Then the whole assemblage would be filled in with debris, and an entirely new circle created nearby. The site may have been built, filled in, and built again for centuries. Bewilderingly, the people at Göbekli Tepe got steadily worse at temple building. The earliest rings are the biggest and most sophisticated, technically and artistically. As time went by, the pillars became smaller, simpler, and were mounted with less and less care. Finally the effort seems to have petered out altogether by 8200 B.C. Göbekli Tepe was all fall and no rise. As important as what the researchers found was what they did not find: any sign of habitation. Hundreds of people must have been required to carve and erect the pillars, but the site had no water source—the nearest stream was about three miles away. Those workers would have needed homes, but excavations have uncovered no sign of walls, hearths, or houses—no other buildings that Schmidt has interpreted as domestic. They would have had to be fed, but there is also no trace of agriculture. For that matter, Schmidt has found no mess kitchens or cooking fires. It was purely a ceremonial center. If anyone ever lived at this site, they were less its residents than its staff. To judge by the thousands of gazelle and aurochs bones found at the site, the workers seem to have been fed by constant shipments of game, brought from faraway hunts. All of this complex endeavor must have had organizers and overseers, but there is as yet no good evidence of a social hierarchy—no living area reserved for richer people, no tombs filled with elite goods, no sign of some people having better diets than others. Hovering over Göbekli Tepe is the ghost of V. Gordon Childe. An Australian transplant to Britain, Childe was a flamboyant man, a passionate Marxist who wore plus fours and bow ties and larded his public addresses with noodle-headed paeans to Stalinism. He was also one of the most influential archaeologists of the past century. A great synthesist, Childe wove together his colleagues’ disconnected facts into overarching intellectual schemes. The most famous of these arose in the 1920s, when he invented the concept of the Neolithic Revolution. Of all the aspects of the revolution, agriculture was the most important. For thousands of years men and women with stone implements had wandered the landscape, cutting off heads of wild grain and taking them home. Even though these people may have tended and protected their grain patches, the plants they watched over were still wild. Wild wheat and barley, unlike their domesticated versions, shatter when they are ripe—the kernels easily break off the plant and fall to the ground, making them next to impossible to harvest when fully ripe. Genetically speaking, true grain agriculture began only when people planted large new areas with mutated plants that did not shatter at maturity, creating fields of domesticated wheat and barley that, so to speak, waited for farmers to harvest them. Rather than having to comb through the landscape for food, people could now grow as much as they needed and where they needed it, so they could live together in larger groups. Population soared. “It was only after the revolution—but immediately thereafter—that our species really began to multiply at all fast,” Childe wrote. In these suddenly more populous societies, ideas could be more readily exchanged, and rates of technological and social innovation soared. Religion and art—the hallmarks of civilization—flourished. Childe, like most researchers today, believed that the revolution first occurred in the Fertile Crescent, the arc of land that curves northeast from Gaza into southern Turkey and then sweeps southeast into Iraq. Bounded on the south by the harsh Syrian Desert and on the north by the mountains of Turkey, the crescent is a band of temperate climate between inhospitable extremes. Its eastern terminus is the confluence of the Tigris and Euphrates Rivers in southern Iraq—the site of a realm known as Sumer, which dates back to about 4000B.C. In Childe’s day most researchers agreed that Sumer represented the beginning of civilization. Archaeologist Samuel Noah Kramer summed up that view in the 1950s in his book History Begins at Sumer. Yet even before Kramer finished writing, the picture was being revised at the opposite, western end of the Fertile Crescent. In the Levant—the area that today encompasses Israel, the Palestinian territories, Lebanon, Jordan, and western Syria—archaeologists had discovered settlements dating as far back as 13,000 B.C. Known as Natufian villages (the name comes from the first of these sites to be found), they sprang up across the Levant as the Ice Age was drawing to a close, ushering in a time when the region’s climate became relatively warm and wet. The discovery of the Natufians was the first rock through the window of Childe’s Neolithic Revolution. Childe had thought agriculture the necessary spark that led to villages and ignited civilization. Yet although the Natufians lived in permanent settlements of up to several hundred people, they were foragers, not farmers, hunting gazelles and gathering wild rye, barley, and wheat. “It was a big sign that our ideas needed to be revised,” says Harvard University archaeologist Ofer Bar-Yosef. Natufian villages ran into hard times around 10,800 B.C., when regional temperatures abruptly fell some 12°F, part of a mini ice age that lasted 1,200 years and created much drier conditions across the Fertile Crescent. With animal habitat and grain patches shrinking, a number of villages suddenly became too populous for the local food supply. Many people once again became wandering foragers, searching the landscape for remaining food sources. Some settlements tried to adjust to the more arid conditions. The village of Abu Hureyra, in what is now northern Syria, seemingly tried to cultivate local stands of rye, perhaps replanting them. After examining rye grains from the site, Gordon Hillman of University College London and Andrew Moore of the Rochester Institute of Technology argued in 2000 that some were bigger than their wild equivalents—a possible sign of domestication, because cultivation inevitably increases qualities, such as fruit and seed size, that people find valuable. Bar-Yosef and some other researchers came to believe that nearby sites like Mureybet and Tell Qaramel also had had agriculture. If these archaeologists were correct, these protovillages provided a new explanation of how complex society began. Childe thought that agriculture came first, that it was the innovation that allowed humans to seize the opportunity of a rich new environment to extend their dominion over the natural world. The Natufian sites in the Levant suggested instead that settlement came first and that farming arose later, as a product of crisis. Confronted with a drying, cooling environment and growing populations, humans in the remaining fecund areas thought, as Bar-Yosef puts it, “If we move, these other folks will exploit our resources. The best way for us to survive is to settle down and exploit our own area.” Agriculture followed. As the dispute over the Natufians sharpened, Schmidt was carefully working at Göbekli Tepe. And what he was finding would, once again, force many researchers to reassess their ideas. Anthropologists have assumed that organized religion began as a way of salving the tensions that inevitably arose when hunter-gatherers settled down, became farmers, and developed large societies. Compared to a nomadic band, the society of a village had longer term, more complex aims—storing grain and maintaining permanent homes. Villages would be more likely to accomplish those aims if their members were committed to the collective enterprise. Though primitive religious practices—burying the dead, creating cave art and figurines—had emerged tens of thousands of years earlier, organized religion arose, in this view, only when a common vision of a celestial order was needed to bind together these big, new, fragile groups of humankind. It could also have helped justify the social hierarchy that emerged in a more complex society: Those who rose to power were seen as having a special connection with the gods. Communities of the faithful, united in a common view of the world and their place in it, were more cohesive than ordinary clumps of quarreling people. Göbekli Tepe, to Schmidt’s way of thinking, suggests a reversal of that scenario: The construction of a massive temple by a group of foragers is evidence that organized religion could have come before the rise of agriculture and other aspects of civilization. It suggests that the human impulse to gather for sacred rituals arose as humans shifted from seeing themselves as part of the natural world to seeking mastery over it. When foragers began settling down in villages, they unavoidably created a divide between the human realm—a fixed huddle of homes with hundreds of inhabitants—and the dangerous land beyond the campfire, populated by lethal beasts. Over time, Schmidt believes, the need to acquire sufficient food for those who worked and gathered for ceremonies at Göbekli Tepe may have led to the intensive cultivation of wild cereals and the creation of some of the first domestic strains. Indeed, scientists now believe that one center of agriculture arose in southern Turkey—well within trekking distance of Göbekli Tepe—at exactly the time the temple was at its height. Today the closest known wild ancestors of modern einkorn wheat are found on the slopes of Karaca Dağ, a mountain just 60 miles northeast of Göbekli Tepe. In other words, the turn to agriculture celebrated by V. Gordon Childe may have been the result of a need that runs deep in the human psyche, a hunger that still moves people today to travel the globe in search of awe-inspiring sights. Some of the first evidence for plant domestication comes from Nevalı Çori (pronounced nuh-vah-LUH CHO-ree), a settlement in the mountains scarcely 20 miles away. Like Göbekli Tepe, Nevalı Çori came into existence right after the mini ice age, a time archaeologists describe with the unlovely term Pre-pottery Neolithic (PPN). Nevalı Çori is now inundated by a recently created lake that provides electricity and irrigation water for the region. But before the waters shut down research, archaeologists found T-shaped pillars and animal images much like those Schmidt would later uncover at Göbekli Tepe. Similar pillars and images occurred in PPN settlements up to a hundred miles from Göbekli Tepe. Much as one can surmise today that homes with images of the Virgin Mary belong to Christians, Schmidt says, the imagery in these PPN sites indicates a shared religion—a community of faith that surrounded Göbekli Tepe and may have been the world’s first truly large religious grouping. Naturally, some of Schmidt’s colleagues disagree with his ideas. The lack of evidence of houses, for instance, doesn’t prove that nobody lived at Göbekli Tepe. And increasingly, archaeologists studying the origins of civilization in the Fertile Crescent are suspicious of any attempt to find a one-size-fits-all scenario, to single out one primary trigger. It is more as if the occupants of various archaeological sites were all playing with the building blocks of civilization, looking for combinations that worked. In one place agriculture may have been the foundation; in another, art and religion; and over there, population pressures or social organization and hierarchy. Eventually they all ended up in the same place. Perhaps there is no single path to civilization; instead it was arrived at by different means in different places. In Schmidt’s view, many of his colleagues have been as slow to appreciate Göbekli Tepe as he has been to excavate it. This summer will mark his 17th year at the site. The annals of archaeology are replete with scientists who in their hurry carelessly wrecked important finds, losing knowledge for all time. Schmidt is determined not to add his name to the list. Today less than a tenth of the 22-acre site is open to the sky.